The United States is projected to reach its legal $14.294 trillion debt limit today. The limit was set by Congress February 12, 2010. The U.S. Treasury may not issue new debt beyond the debt ceiling. Since April 2011, Congress has debated ways to remain below the nation’s $14.292 trillion borrowing limit. The debate commenced with the passage of the 2011 U.S. Federal Budget which featured a $1.645 trillion deficit. For home buyers and rate shoppers in Nashville , this is an important development. The debt ceiling agreement will influence mortgage markets and, as a result, require amendments to home affordability calculations. As mortgage rates change, your purchasing power does, too. Since the prospect of a deal was first hinted Friday, mortgage rates have been improving. Conforming, 30-year fixed rates are down nearly 0.250 percent, lowering a $150,000 mortgage payment by $22 per month. 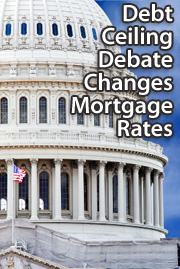 By Phillip Cantrell|2015-02-11T15:01:10-05:00August 2nd, 2011|Agent Blog, Consumer Blog, The Economy|Comments Off on What Will The Debt Ceiling Agreement Do To Mortgage Rates?